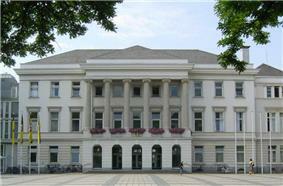 Krefeld (German pronunciation: ), also known as Crefeld until 1929, is a city in North Rhine-Westphalia, Germany. It is located northwest of Düsseldorf, its centre lying just a few kilometres to the west of the River Rhine; the borough of Uerdingen is situated directly on the Rhine. 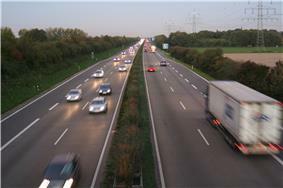 Krefeld is accessed by the autobahns A57 (Cologne–Nijmegen) and the A44 (Aachen–Düsseldorf–Dortmund–Kassel). Krefeld's residents speak Hochdeutsch, the standard German taught to all people in Germany. However, the native dialect is a Low German variety, sometimes locally called Krefelder Plattdeutsch, Krieewelsch Platt, Plattdeutsch, or sometimes simply Platt. The Uerdingen line isogloss, separating general dialectical areas in Germany and neighbouring Germanic-speaking countries, runs through and is named after Krefeld's Uerdingen district, originally an independent municipality. The town originated in Roman times when the legions founded the military camp of Gelduba (today the borough of Gellep). 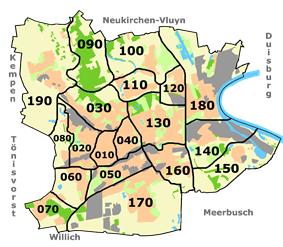 Records first mention Krefeld itself in 1105 under the name of Krinvelde. 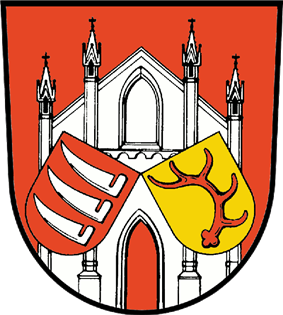 Uerdingen, originally an independent town east of Krefeld, founded in 1255, became in medieval times larger and more important than Krefeld. The growth of the town began in the 17th century, when Krefeld was one of few towns spared the horrors of the Thirty Years' War (1618-1648). In 1683 a group of thirteen families (Quakers and Mennonites) left Krefeld at the invitation of William Penn to re-settle in Pennsylvania in order to enjoy religious freedom. They crossed the Atlantic on the ship Concord, and founded the settlement of Germantown (now incorporated in Philadelphia), thus beginning the Pennsylvania German ethnic identity. The town of Uerdingen experienced a less fortunate 17th century; troops from Hesse completely destroyed it in the Thirty Years' War and it almost ceased to exist. After the 1702 death of William III of Orange, Krefeld passed to the Kingdom of Prussia. The Battle of Krefeld occurred nearby in 1758 during the Seven Years' War. Krefeld and Uerdingen were included within the Prussian Province of Jülich-Cleves-Berg in 1815 (after 1822 the Rhine Province). 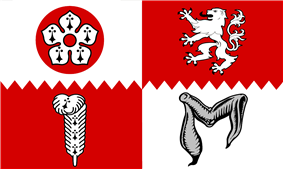 In 1872 Krefeld became an independent city within Rhenish Prussia. During part of 1918 the Belgian Army used it as a base during the occupation of the Rhineland after the First World War. In 1929 Krefeld and Uerdingen merged to form Krefeld-Uerdingen; in 1940 the name was shortened to simply Krefeld. During World War II, on December 11, 1941, a detailed report on the transport of Jews from Krefeld and its surroundings to the Šķirotava Railway Station near Riga, later to become Jungfernhof concentration camp, listed 1007 Jews from Krefeld and Duisburg, deported in freezing conditions with no drinking-water for more than two days. Almost immediately upon arrival these Jews were shot in the Rumbula forest massacre. On 21 June 1943 British bombs destroyed large parts of east of the city; a firestorm consumed most of the city center (apart from the central train station, which remained intact apart from minor damage). On 3 March 1945 US troops entered Krefeld, among them the later U.S. Secretary of State Henry Kissinger who was charged with setting up an interim government. After the war the steelworks were to be dismantled, but this was prevented. The town became part of the new state of North Rhine-Westphalia after World War II. Jews were listed as citizens of Krefeld from 1617. In 1764 a synagogue was erected, and by 1812, under French rule, the town included 196 Jewish families, with three Jewish-owned banks. Under Napoleon, the town became the capital for the surrounding Jewish communities including over 5000 Jews, and by 1897 they comprised 1.8% of the population. In 1846 a Jewish representative was voted onto the town's municipal council, while rising antisemitism was noted during these elections. A reform synagogue was built in 1876, arousing opposition from the Orthodox community. A Jewish school existed in the town, with more than 200 students around 1900. In 1938 during Kristallnacht, the two synagogues were attacked and burnt. In 1941 following an order from Hitler to deport the German Jews to the east, Jews from the town were sent to the area around Riga and murdered there. In 1945, the U.S. Army occupied the city and placed Henry Kissinger, then an Army private and later Secretary of State of the United States, in charge of the city administration. In 2008 a new synagogue, library and Jewish cultural center were erected on the location of one of the demolished synagogues. Around 1100 Jews were reported to live in and around Krefeld at the time. Linn, with its own history reaching to between 1090 and 1120, was situated on the banks of the Rhine. 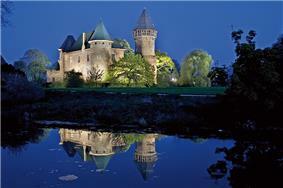 In Linn, there is a park built around a Wasserburg, a castle built at the water's edge, and with a water-filled moat. The Burg Linn, as the castle is known, has been preserved for the city's residents as a park and museum. Krefeld is connected to the Deutsche Bahn network with several stations, including its main station, Krefeld Hauptbahnhof. They are served by Intercity, Regional-Express and Regionalbahn trains. The Düsseldorf-based Rheinbahn operates a Stadtbahn service to the centrally located Rheinstraße stop. This line was the first electric inter-city rail line in Europe, established in 1898, and commonly called the K-Bahn because of the letter "K" used to denote the trains to Krefeld. Nowadays, in the VRR notation, it is called U76, with the morning and afternoon express trains numbered as U70, the line number there coloured red instead of the usual blue used for U-Bahn lines. The term K-Bahn, however, prevails in common usage. The city of Krefeld itself operates four tramway and several bus lines under the umbrella of SWK MOBIL, a city-owned company. Since 2010, 19 of the oldest trams of the type DUEWAG GT8 were replaced by modern barrier-free trams of the type Bombardier Flexity Outlook. SWK Mobil owns an option to buy another 19 trams of the same type to replace the last 19 DUEWAG M8 trams. The whole tram fleet will then be barrier-free. Next to that the city plans to extend the line 044 in Krefeld-Hüls to connect the northern district of Hüls with the Krefeld downtown area. The headquarters of Fressnapf, a pet food retailer franchise company, are situated in Krefeld. Since 1964, the city has hosted an "honors program in foreign language (German) studies" for high school students from Indiana, United States. The program annually places approximately thirty carefully selected high school juniors with families in and around Krefeld for intensive German language training. Since 1973, the fire services of Krefeld and twin city Leicester have played each other in an annual 'friendly' football match. ^ a b c d Jews of Krefeld Yad Vashem website. Town citizen Isaac Meyer Fuld, a member of the family of Heinrich Heine, was a prominent bank-owner in Germany at the time. ^ Walter Isaacson, Kissinger: A Biography, p.48. ^ Brown, Tom (31 July 2013). "Twin towns: Do we still need them?". BBC East Midlands Today (BBC News). Retrieved 2013-08-07.